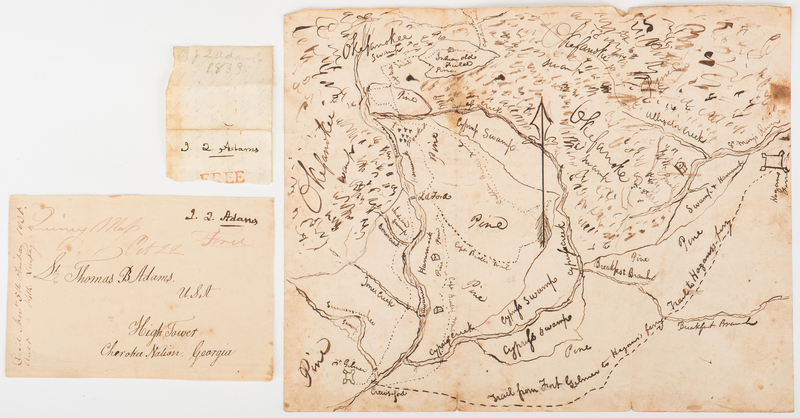 Hand drawn Okefenokee Map, and 2 John Quincy Adams signed free franked envelopes, 3 items total. 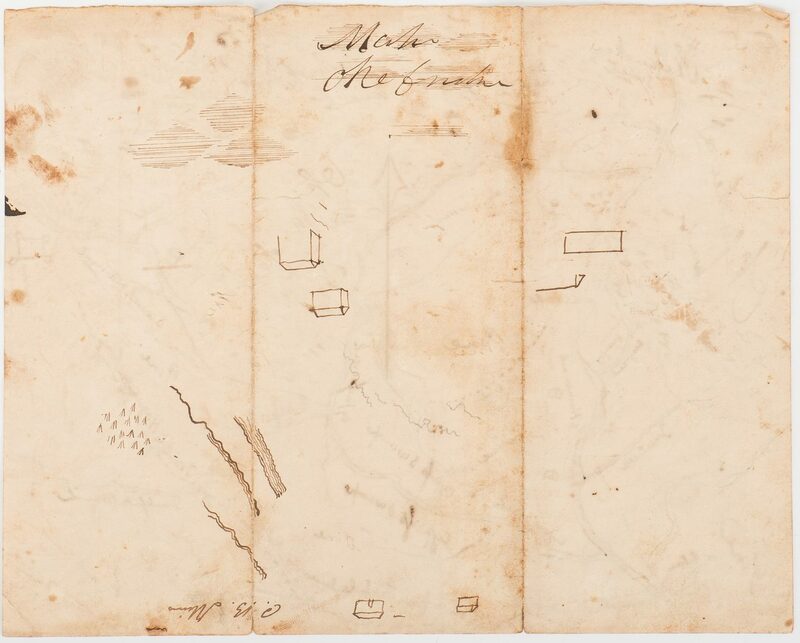 1st item: Ink on paper hand drawn map depicting the area comprising the Cherokee Nation lands in Georgia, dated circa October/November 1830. 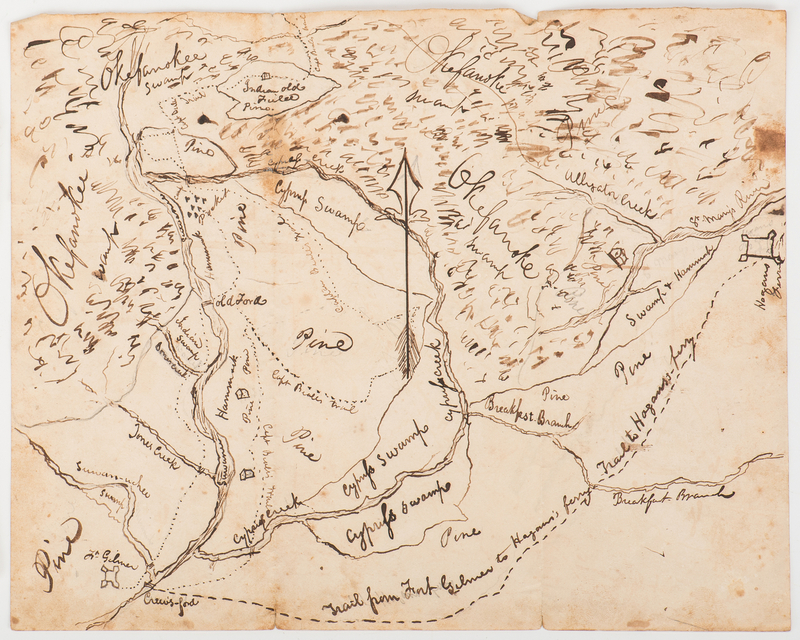 The map depicts forts, trails, and other areas of interest including Hogan's Ferry with a trail leading from Fort Gilman (established and abandoned within a year), Camp Pocket, the Indian Old Field Pino, several interconnect trails marked as Captain Beall's Trail, and other locations in an around the Okefenokee Swamp. 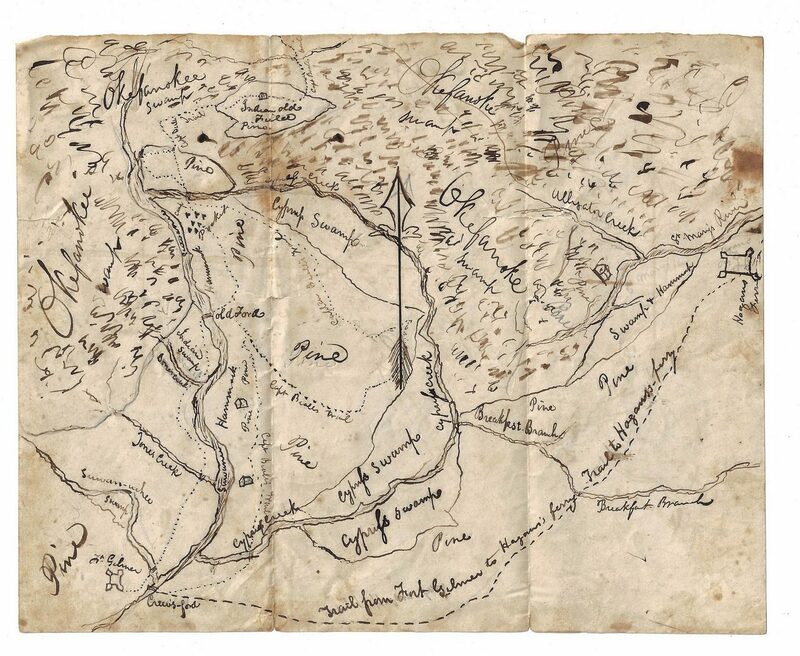 "Map Okefenokee" with several rudimentary sketches of buildings, rivers, and other topographical features and the signature "C.B. Mims", en verso. Single directional arrow pointing North, center of map. 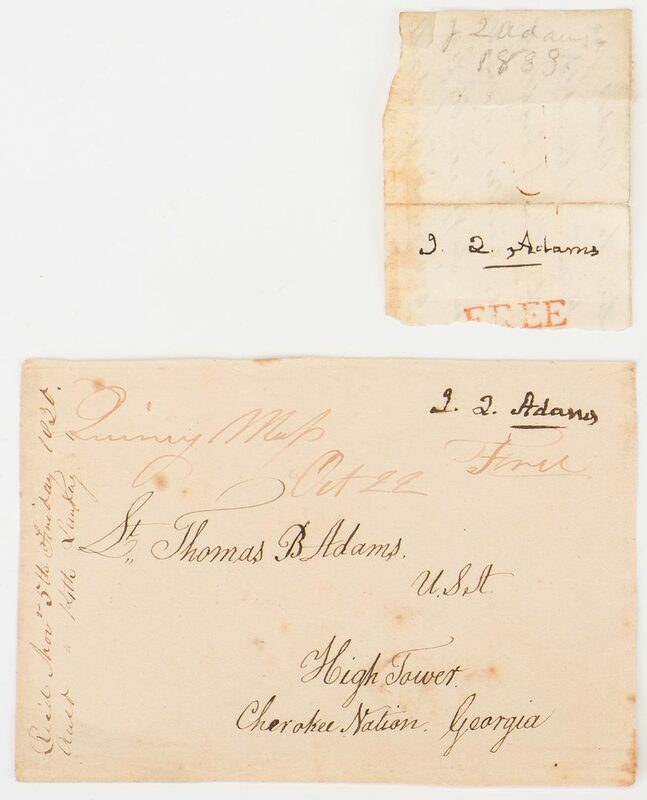 7 7/8" H x 9 7/8" W. 2nd item: John Quincy Adams signed free franked envelope after his term as 6th President of the United States (1825-1829) addressed to his nephew Thomas Boylston Adams, Jr., (1809-1837), High Tower, Cherokee Nation, GA, dated circa October/November, 1830. It refers to the Okefenokee Map with notation reading "Quincy Map Oct 22" with additional notation reading "Rec'd Nov 5th Friday 1830. Ansd " 14th Sunday ". Address and notation about map in writing probably by a secretary or local postmaster, other notations possibly by Thomas B. Adams, Jr. 3 5/8" H x 5 1/4" W. Biography: Thomas Boylston Adams, Jr. was a grandson of President John Adams; his father Thomas Boylston Adams, the president's third son, was thus also a younger brother of President John Quincy Adams. He was a Cadet at the Military Academy, July 1, 1824, to July 1, 1828, when he was graduated and promoted in the Army to Bvt. Second Lieut. of Artillery, July 1, 1828. Second Lieut., 2nd Artillery, July 1, 1828. Served in garrison at Ft. Monroe, Va. (Artillery School for Practice), 1828-29, — and Ft. Moultrie, S. C., 1829, 1829-30; in Cherokee Nation, 1830; in garrison at Charleston harbor, S. C., 1830-31, 1831-32; in Cherokee Nation, 1832; on Ordnance duty, Dec. 13, 1832, to Jan. 17, 1836. He was promoted to First Lieut., 2nd Artillery, Dec. 1, 1834. In the Florida War against the Seminole Indians, 1836-37, being engaged in the Skirmishes at Camp Izard, Feb. 27, 28, 29, and Mar. 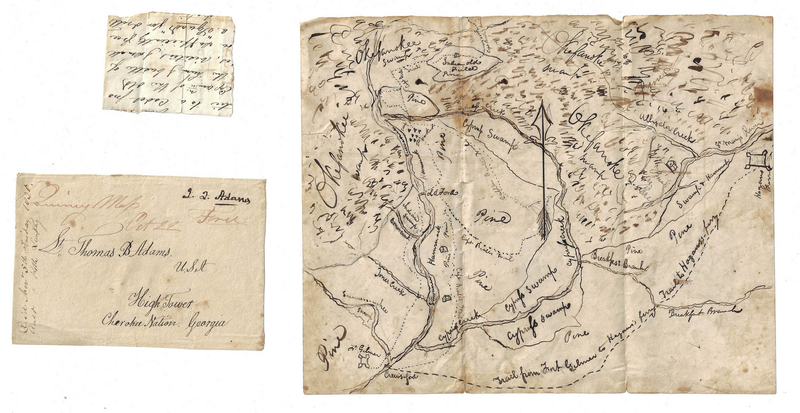 5, 1836,– and Action of Oloklikaha, Mar. 31, 1836. He died, Dec. 14, 1837, of a fever at Fort Dade, Florida, during the Second Seminole War. (source: http://penelope.uchicago.edu/Thayer/E/Gazetteer/Places/America/United_States/Army/USMA/Cullums_Register/519*.html#note:additional_information). 3rd item: Fragment of John Quincy Adams signed free franked envelope after his term as 6th President of the United States (1825-1829). "FREE" stamped in red lettering below signature. Pencil notation reading "J Q Adams 1833" above. 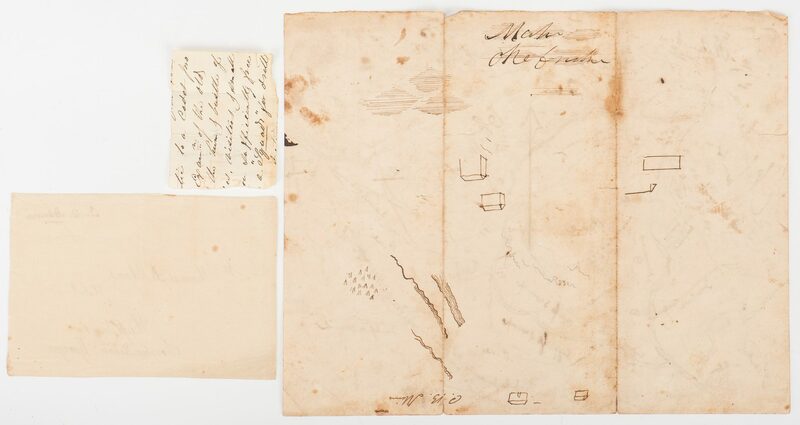 Fragment of letter referring to a Cadet and a Squad, en verso (does not appear to be written in Adams' hand). 2 3/4" H x 2 1/8" W. Provenance: The Estate of Charles Boyd Coleman, Jr., Chattanooga, TN. Descended in his family from Charles Harrod Boyd, grandson of Charles Harrod (1787-1870). Charles Harrod was the brother of Ann (Anna) Frances Harrod Adams (wife of Thomas Boylston Adams, 1772-1832, the son of President John Adams). Note: Charles H. Boyd's wife, Annette Maria Dearborn Boyd, was the daughter of Greenleaf Dearborn (1786-1846) and great granddaughter of Maj. General Henry Dearborn (1751-1829) on her mother's side. She and Charles Harrod Boyd had four children, including Julia Wingate Boyd, who married Lewis M. Coleman, Jr., Chattanooga, TN, a direct descendant of John Marshall (1755-1835). John Marshall was the Fourth Chief Justice of the United States and also served as Secretary of State under John Adams (1800-1801). CONDITION: 1st item: Overall good condition with foxing spots, areas of dampstaining, and tears, largest 3/4", surface of map. Writing in strong, clear condition. 2nd item: Adams' signature in strong, clear condition. Overall good condition with foxing spots, surface of sheet (does not affect signature). 3rd item: Adams' signature in strong, clear condition. Overall good condition with toning, left side (does not affect signature).